On the 10th September 2017, Action Sport Games and Halo Mill Proving Grounds near Huddersfield hosted the very first ASG Scorpion EVO Owners club event in the UK (and the first game of its kind in the UK to my knowledge) – an event dedicated entirely to everything EVO and we went along to see what the crack was. Early in 2016, the ASG Scorpion EVO Owners Group on Facebook was created, a forum where EVO owners could log on and show off their EVO builds, ask for tech advice, support etc and it has grown in size to around 2,500 members. It was only a matter of time before all these players came together at one event to show their support! 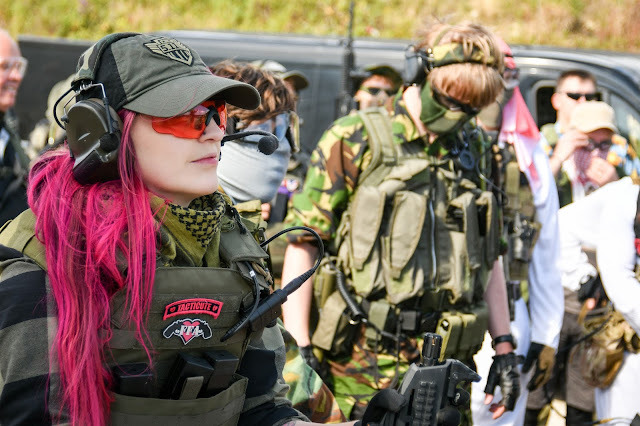 The game was held at Halo Mill: Proving Grounds which is run by Patrol Base and is based at the Yorkshire Paintball Centre (YPC) in Skipworth. It is a large outdoor woodland site that has a huge, impressive bridge structure at the heart of a dense fern woodland. Halo Mill: Proving Grounds is a 2-hour drive from my home in the East Midlands so I set off super early to get there in time for the festivities. The day started with participants arriving from 8am. The site had a pretty sizable car park that was already filling up by the time I arrived at 8.30am, as we dragged our kit from the car to the safe zone the route was filled with banners and flags announcing the game. At the registration desk, players were given a goodie bag filled with patches, BBs and stickers to welcome them to the event. The safe zone was pretty full by the time I had arrived, but there was still plenty of space for the player limit of 300! The safe zone facilities were actually very good – despite it being an outdoor site everything was undercover. The games started at around 10am after everyone had got kitted up and pumped to play. The safety brief was comprehensive and covered all bases. The games for the day were points based objective games where players had a certain time limit to complete them in. Our first objective was to secure the bridge – as soon as the whistle had been sounded to signal game on, players were rushing towards the bridge from both sides. Our team made it onto the bridge first but we were contested and spent our allocated time limit having a fierce firefight over the length of the bridge until eventually we were pushed back off the bridge. Our objectives included taking and maintaining control of areas/landmarks on the site. Games in the morning lasted from 10am until around 1pm. I was actually super impressed with lunch at Halo Mill: Proving grounds, on arrival we were given lunch tokens to use during the break and it included either a slice of pizza, a pasty, a burger or a hot dog along with a chocolate bar and a hot/cold drink. After the lunch break, there was a huuuge raffle, probably one of the biggest I have seen at a game in the UK. Prizes included: HB Industries EVO rail (long EVO B.E.T build), HB Industries EVO rail (short EVO CQB build), Scorpion EVO Carbine, ASG Bren plus mag adapter, real steel gen 1 ironsights, M4 stock adapter, hand stop, EVO flash hider, EVO sling, mag clamps, EVO bag, EVO peli case, MP9 14mm Adapter, Yeti patches and stickers, Yeti Wurks grip (for HPA only), Manticore patches and stickers, Green EVO owners patches, EG hoodie, two Scorpion AEPs, CZ P-09, CZ pistol case, CZ Shadow, Smoked EVO mags, EVO hi cap and others such as patches, tees and stickers. There was also a competition for the best custom Evo. After the lunch and the raffle, the games kicked back off with the same objective style. My team in the afternoon’s mission was to defend different points on the map from the other team, which included the bridge, bomb dump etc Games in the afternoon were played from 3pm until 5pm. On the day the owners’ group had asked other retailers to attend to support the day, including Patrol Base, Yeti Wurks, HB Industries, Manticore Arms Inc., 3D soft, Scorpionskinz, Viper Tactical, Wolverine Airsoft and HD Prototyping which added another element to the event. Players could check out and purchase products specifically for the EVO and also check out new prototype products. It was a fantastic event but it was quite eerie, it was very strange going to a game day and only hearing one type of weapon being fired and because the Scorpion EVO is a top line AEG out of the box a lot of owners choose to forego upgrading them or changing the internals, because of this the teams were very evenly matched in regards to firepower. I think these sorts of events are really good for the community as well. It’s really cool to see the community coming together over their shared love of a weapon. Overall I think the first ASG Scorpion EVO owners’ event was a resounding success and I am thoroughly looking forward to the next! Hardwick, K. (2017). ASG Scorpion EVO Owners. Airsoft Action. 82 (Xmas), 38-41.
any news on if this event will be on this year (2018) id be up for attending as my evo is currently my fave blaster.. and could do with a bit of an external update.